Polycystic Ovary Syndrome (PCOS) is a condition affecting as many as 1 in 10 women of childbearing age. Whilst it can occur in those as young as 11, it’s more likely to affect adults, and it is thought genetics play a role in its development. If your mother or sister has PCOS, you’re more likely to develop the condition yourself. PCOS is a condition which can affect your menstrual cycle, hormone levels, your heart and your ability to have children. The condition can also cause irregular or missed periods, small ovarian cysts and high levels of androgens in your body; it can also impact your appearance, including your hair. Women with PCOS may notice their hair becomes brittle, thin and frizzy – some may notice a change in texture or be aware of more hair coming out on their brush or in the shower than usual. The cause of PCOS is still unknown. The hormonal imbalance caused by the condition causes the body to produce high levels of androgens – these are male hormones that are normally produced in small quantities in women. High androgen levels can lead to weight gain, ovulation problems, excessive hair growth and acne. Other symptoms of the condition include infertility, absent periods, dandruff and oily skin, anxiety and depression. In order to help reduce shedding and prevent hair loss, there are a few steps you can take. You should see a hair loss specialist if you are concerned about sudden or unusual levels of hair fall, but following a proper diet designed for those with PCOS, getting plenty of sleep and minimising stress can also help. Pay attention to your hair care routine – try to avoid pulling hair back tightly or using harsh chemicals such as bleach or relaxers. When done frequently these actions can lead to hair breakage, which makes hair look even thinner, and place too much strain on the follicles, which can cause further hair loss from a condition known as Traction Alopecia. Medication prescribed for PCOS can often have an impact on your hair, so it’s worth considering discussing alternative medications with your doctor if you feel your current prescription has caused problems for your hair. Many women with PCOS also have an underactive thyroid, so you should have your thyroid levels checked to rule this out as a cause of hair thinning. Hair should begin to grow back with the right diet and medication, but a specialist can recommend a personalised hair loss treatment plan to repair any existing damage and ensure optimal health for your hair going forward. Should a woman have a genetic predisposition to the hereditary condition Female Pattern Hair Loss, this can be exacerbated or its premature onset triggered by the temporary shedding PCOS can cause. 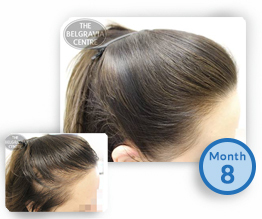 This is a permanent hair loss condition but clinically-proven, MHRA licensed and FDA-approved treatments exist. Should both temporary and permanent conditions present simultaneously – this normally displays as thinning hair all over the scalp which appears more intense towards the top of the scalp, from hairline to crown – a treatment course can be tailored to tackle both issues at once. The first step, however, should be to have an expert diagnosis so you know precisely what you are dealing with and can get all the details you need to make an informed choice as to which hair regimen is best for you.